Not long ago I reported back about a delicious Prior CoffeeBerry facial and my thoughts on their stellar new range of mineral powders and brushes, so I was super excited to hear that they have yet another new release on the horizon, this one nourishing from the neck down. 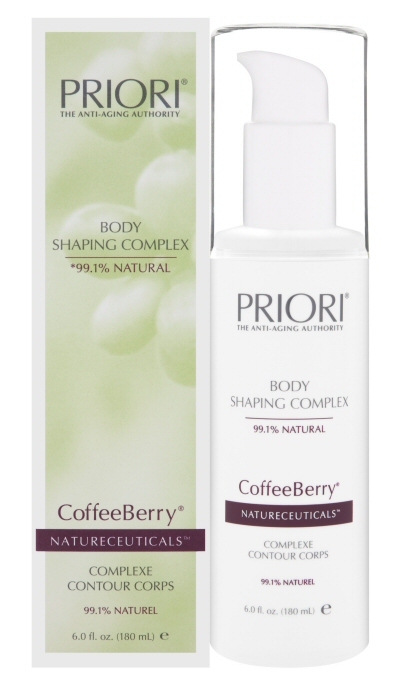 Yes, you heard right - cosmeceutical powerhouse Priori have focused their R&D efforts on the body and created the 99.1% natural Body Shaping Complex. This lightweight, non-greasy body treatment harnesses the power of super anti-oxidant CoffeeBerry to tighten and tone the body, contouring your curves and effectively decreasing the appearance of cellulite. Other natural/botanical ingredients in there are the ever-popular Argan oil, Sunflower Seed Oil, Shea Butter, Beeswax, Algae Extract, Pullulan, Mica, Silica and Vanilla Fruit Extract. Great on those bingo wings, post pregnancy tums and the usual cellulite prone zones, it is suitable for most skin types, dermatologist tested, non-comedogenic and colourant and paraben free Free. Allergy Tested. Paraben Free.